Did Kris Aquino unfollow Karla Estrada, Jolina Magdangal? Did Kris Aquino unfollow Karla Estrada, Jolina Magdangal on Instagram? Kris Aquino says she did not intend to unfollow Karla Estrada and Jolina Magdangal on Instagram. "I actually didn't know na na-unfollow. And I'm sorry if it's an issue na na-unfollow. Sasabihin ko sa kanilang i-follow nila ulit if it's an issue," she explains. 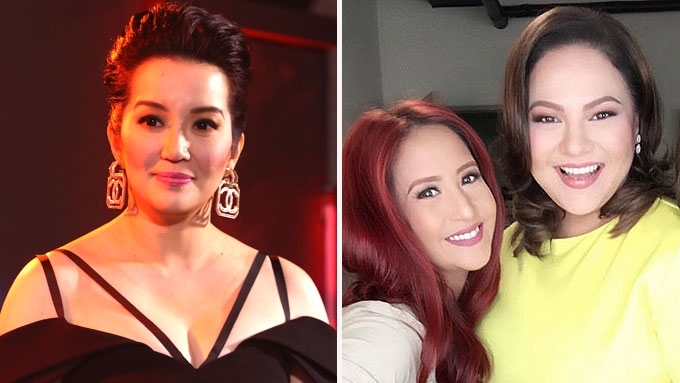 Kris Aquino clarified an Instagram fiasco in which it appeared she had unfollowed her former ABS-CBN colleagues Karla Estrada and Jolina Magdangal. The 46-year-old TV host-actress said, “Alam mo, actually, dapat ko bang aminin ito? "My Instagram, tatlo kaming may hawak ng Instagram. Kris gave the statement more than a week after word got out that she unfollowed the two co-hosts of the Kapamilya morning talk show Magandang Buhay. Note that Magandang Buhay replaced Kris TV, the now-defunct morning talk show of Kris which had the same timeslot. It was also during Karla's frequent appearances on Kris TV that the former got tagged as "Queen Mother." Kris, for her part, did not mention anything about having a falling out with either Karla or Jolina. So did anyone who has access to her Instagram unfollow Karla and Jolina by accident? Kris answered, "Tatanungin ko sa kanila. Magtatanong ako kung ano. I'm sorry, ha..."
KRIS SAYS SORRY. Kris went on to apologize for causing an "issue" the moment other people noticed that she's no longer following Karla and Jolina on Instagram. She elaborated, “I actually didn’t know na na-unfollow. "And I’m sorry if it’s an issue na na-unfollow. “Sasabihin ko sa kanilang i-follow nila ulit if it’s an issue. At any rate, Kris reiterated that she writes the caption in all of her Instagram posts, but she also has two other staff managing her account. Kris spoke to selected entertainment reporters, including PEP.ph (Philippine Entertainment Portal), after she was launched as the newest face of iflix. The media event was held last night, July 27, at the Bonifacio Hall C of Shangri-La The Fort, Taguig City. OLD AND NEW FRIENDS. While it has been almost a year since Kris bade farewell to ABS-CBN, her home network of 20 years, the TV host said that she has remained friends with all her former bosses as well as other Kapamilya stars she previously worked with. Kris mentioned in particular that she's "super close" to Kim Chiu and still in communication with Iza Calzado. She said, “Yung mga dati kong kaibigan have remained my friends. “I don’t think you just erase everything just like that. And I think that’s so weird. Since leaving ABS-CBN, Kris noted that she also made new friends, but did not elaborate if any of them is from a particular TV network.